Silicon particle reinforced aluminum containing 42 wt.% silicon (Al-42Si) offers higher specific stiffness, higher resistance to thermal gradients, and an athermal behavior combined with electroless nickel, in comparison to state-of-the- art aluminum alloys (e.g. Al6061). Nevertheless, typical surface modifications (e.g. black anodization) lead to a non- sufficient optical stray light suppression due to the high amount of silicon particles on the surface. Therefore, a coating technique is required that fulfils the optical and the mechanical (e.g. adhesive strength) specifications for stray light reduction on Al-42Si. Different components like housings and barrels made of Al-42Si were coated with amorphous NiP and with Fractal BlackTM by Acktar Ltd. The optical performance is analyzed by angle-resolved light scattering (ARS) at two different wavelengths (532 nm and 1064 nm). Fractal BlackTM offers a total scattering level of lower than 2 % at 532 nm and 1064 nm. Fractal BlackTM has been proven as a suitable coating for components made of Al-42Si. 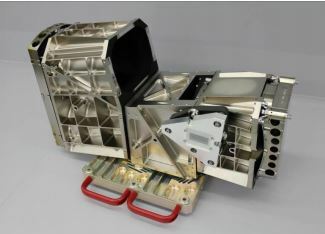 For earth-observation satellites, many optical systems such as spectrometers are based on reflective optics (mirrors) that can be realized by, e.g. ultra-precise manufacturing of aluminum based materials in combination with a polishable layer of amorphous nickel-phosphorus alloy (NiP) [1-7]. For an athermal system behavior, the necessary housing structure is realized out of the same material. Besides the more critical mirrors, the housing structure has to fulfill several requirements, as well. On the one hand, the mechanical behavior (e.g. stiffness, dimensional stability) and thermal behavior (coefficient of thermal expansion (CTE), thermal conductivity) are important. On the other hand, the inner structure of the housing has to show reduced stray light behavior [8-11]. Achieving lowest stray light levels in optical systems does not only require optical components with lowest imperfections in particular in terms of defects and roughness in the relevant spatial frequency range. Moreover, non-optical surfaces ranging from baffles close to the optical beam path to mounts and other mechanical components have to be optimized in terms of light scattering as well. For these surfaces, the usual, (not necessarily the only) approach is to reduce the reflectance from high (metallic) to low (by increasing absorption) and to change the scattering from specular (mirror-like) to diffuse. The resulting surface looks black and matte . Thorough knowledge of the light scattering properties of such materials at all wavelengths and angles of incidence relevant for the application is extremely extremely important for developing accurate stray light models and to ensure that the surface meets all requirements . Al6061 is a commonly used alloy for athermal optical systems, mirrors and housings . Stray light reduction of Al6061 is typically realized by anodizing the surface [13-16]. For hyperspectral and multispectral optics in the visible spectral range, a polishable layer is necessary to fulfill the specifications, e.g. micro roughness and shape deviation of the mirrors. State of the art is an amorphous electroless nickel-phosphorus layer . Optical systems composed of mirrors and housing structures preferably show an athermal behavior. Therefore, the components should be manufactured of the same material. Silicon particle reinforced aluminum with a silicon content of approximately 42 wt.% (Al-42Si) and NiP show coefficients of thermal expansion with a difference of lower than 0.5 ppm K-1 . Athermal metal mirrors made of this material combination are thus perfectly suited for application environments differing from room temperature. Ensuring an athermal performance of the entire optical system, the necessary housing is made of the same material, Al-42Si. Enabling a better corrosion resistance, it is possible to coat the housing with a thin electroless nickel layer . In order to avoid ghost images and stray light in optical systems, non-reflective surfaces are usually coated with a black coating. However, there is no coating established for Al-42Si that significantly reduces stray light. The purpose of the paper is to describe different possibilities to reduce stray light on a silicon particle reinforced aluminum material. Silicon particle reinforced aluminum material containing an amount of 42 ± 2 wt.% silicon particles is produced by spray-forming and subsequently hot-isostatic pressing . For spray forming, the molten metal is atomized by nitrogen at high velocity. The small droplets are directed on a cold rotating plate and condense. This rapid solidification process enables cooling rates of 104 to 105 K /s and leads to some porosity of the material. But hot-isostatic pressing eliminates the porosity and the silicon particles coarse. Spray forming and hot-isostatic pressing lead to isotropic and relatively fine-grained microstructure, shown in Fig. 1. Figure 1. Microscopic structure of Al-42Si (dark gray: Si particles, light gray: Al matrix). The silicon particles show a maximum size of about 40 μm, the aluminum matrix is a relatively pure Al-Si alloy. Compared to state-of-the-art aluminum materials, e.g. Al6061, Al-42Si shows a higher specific stiffness. Furthermore, the silicon particles lead to a decreasing CTE. 42 wt.% silicon particles lead to a coefficient of thermal expansion at 20 °C of 13 ppm K-1 (Al6061: 23 ppm K-1 ; electroless NiP: 12.6 ppm K-1 ) . The lower CTE causes a higher resistance against thermal gradients (thermal conductivity over the CTE). Al-42Si is machinable by different CNC techniques, like turning and milling. Especially for housing structures with a high amount of material removal electrical discharge machining is suitable, too. Electroless NiP is a metallic alloy, containing nickel and phosphorus . This alloy is suitable for metallic substrates by a wet chemical coating process, which enables the coating of the whole surface of complex shaped parts, e.g. optics and housings. A phosphorous concentration higher than 10.5 wt.% (high-phosphorous electroless NiP) lead to an amorphous structure [17,23,24]. For metallic mirrors a high-phosphorous electroless NiP layer with a thickness of 20 μm to 150 μm is typically used, enabling several polishing techniques, like chemical mechanical polishing or magneto-rheological finishing [25,26]. Furthermore, electroless NiP is a widely used corrosion protection plating for, e.g., off-shore and aerospace applications . In case of housing structures, electroless NiP improves the corrosion resistance. In particular, the interfaces of mirrors and the housing do not show any electrochemical corrosion, due to free contact of aluminum and electroless NiP. In Fig. 2, different housing structures are show for the example opto-mechanical system DESIS (DLR Earth Sensing Imaging Spectrometer). Figure 2. Housings for DESIS (Body, Three Mirror Anastigmat, Offner spectrometer). 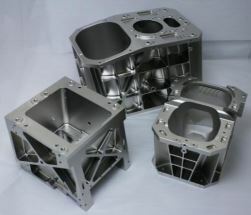 The housings are made of Al-42Si rough parts that have been CNC milled, electrical discharge machined, and plated with 10 μm high-phosphorous NiP. The housings are optimized by means of light weighting, accuracy, and stiffness. The structures include all alignment interfaces for the mirror mounting, following the snap-together concept [12,25,27]. Several techniques are established for stray light reduction of aluminum based materials . For stray light reduction of Al6061 parts different wet-chemical techniques are possible. Especially, black anodizing is a well-established surface modification of aluminum. Anodizing is a wet chemical process, used to increase the thickness of the oxide layer on the surface of aluminum parts. This process is an electrolytic passivation process commonly using sulfuric acid as electrolyte and the aluminum part as the anode. The current density used is regulated to overcome the passivity of the aluminum part and to cause oxidation of the surface. After the anodizing process, the surface can be, e.g., colored by immersion in metallic salts [11,28]. Another possible surface modification for stray light reduction of aluminum parts is plasma chemical coating. In this wet chemical process, the electrolyte is a saline solution. The aluminum part works as anode by using an external power source. In the process of anodization, oxygen plasma discharges onto the part’s surface. The surface forms a thin barrier layer. On the surface, a low porous and thereafter a high porous aluminum oxide layer are built. Those black coatings are suitable for mirrors and housings. Additionally, this surface modification increases the corrosion resistance and the hardness of the aluminum parts. Acktar black coatings (e.g. Fractal BlackTM) are among the blackest coatings known. Due to its very low reflectivity, the coating is attractive for use in optical systems, particularly in space optics. An extensive program of testing was performed in the last decades within several space instrument projects in order to qualify the Acktar Fractal BlackTM for use in space applications. The coating performance is stable in a wide temperature range. It is qualified between -269 °C and 450 °C. Moreover, Acktar Fractal BlackTM is tested and qualified regarding outgassing (space and ultra-high vacuum compatibility), atomic oxygen resistance, adhesion, and cleanliness/particulation. Acktar Fractal BlackTM is fabricated using a proprietary vacuum deposition technology. A very high specific surface area coating is created with a tightly controlled morphology to produce a very low reflectance level. The density of the coating is typically ~1.8 g/cm3. Depending on the substrate material (Al-42Si coated by electroless NiP) the deposition process is carried out at temperatures below 200 °C. By controlling the composition and morphology of the layer microstructure, the process can be tailored to achieve desired levels of absorption or reflectance over a wide range of wavelengths. In this study, three different techniques were analyzed regarding the reduction of stray light for housings of optical applications. Anodizing and plasma chemical coating are wet chemical modifications of the surface of the aluminum parts. Acktar coating is a black coating on top of the surface, without changing the structure of the substrate. In case of Acktar coatings, the coating free areas of the housing have to be coated for corrosion reasons. In case of Al-42Si electroless NiP is suitable as coating material, especially in combination with mirrors made of the same material combination. Thus, the housings were coated with electroless NiP completely, prior to the selective coating of the innerstructures of the housings with Fractal BlackTM. For stray light measurements, representative samples with a diameter of 25 mm and a height of 10 mm made of Al-42Si were prepared. In case of anodizing and plasma chemical coating the processes were carried out, directly. 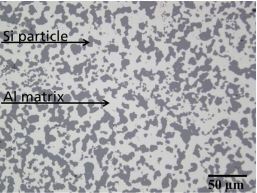 In case of Acktar Fractal BlackTM, the Al-42Si sample were electroless NiP plated (thickness: 10 μm) prior to the coating at Acktar Ltd., shown in Fig 3. Figure 3. Different coated Al-42Si samples (f.l.t.r. black anodization, Acktar Fractal BlackTM and plasma chemical coating). Obviously, the anodized sample and the plasma chemical coating are light grey colored; Fractal BlackTM exhibits a black surface. s denotes the polar angle of scattering measured with respect to the sample normal, Ps is the power scattered into a certain direction, s is the detector solid angle, and Pi is the incident power. Very often, the cosine factor is omitted leading to the so-called cosine-corrected BSDF or simply ARS (Angle Resolved Scattering). The ARS measurements presented here were performed at 532 nm and at 1064 nm, respectively, and with different angles of incidence using the instrument described in detail in . The results are shown in Fig. 4. Figure 4. Angle resolved scattering of different coated Al-42Si at 532 nm (left) and 1064 nm (right). The paper describes a suitable procedure to reduce stray light of opto-mechanical systems made of a silicon particle reinforced aluminum (Al-42Si). Three procedures were tested: Black anodization, plasma chemical coating, and Acktar Fractal BlackTM. Surface modifications, like black anodization and plasma chemical coating lead to a non-sufficient optical stray light suppression due to the high amount of silicon particles on the surface. In case of the selective coating with Acktar Fractal BlackTM on the inner structure of housings, a thin electroless NiP plating increases the corrosion resistance of Al-42Si on the entire surface. Figure 5 shows the opto-mechanical system DESIS developed within this work. The outer structure of the housings is coated with electroless NiP, the inner structure is coated with Acktar Fractal BlackTM. Figure 5. Optical system of the DESIS instrument, composed of aligned mirrors and housings. The light gray, triangularbody is a detector dummy. The authors acknowledge funding of basic research used for the presented application by German Aerospace Center (DLR) within the projects IRS-ServoTech and VISTEL under grant numbers 50EE1006 and 50EE1224, respectively. The basic research on freeform manufacturing was funded by the BMBF initiative “Unternehmen Region – Innovative Regionale Wachstumskerne” under grant number 03WKCK1B. The authors like to thank David Krutz and his DESIS team from DLR OS Institute in Berlin Adlershof for successful collaboration in the DESIS project.